What is the Living Barge? 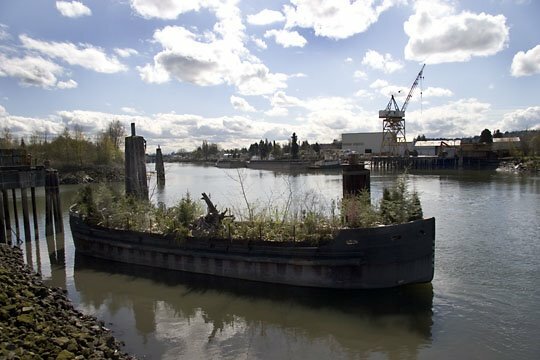 The Living Barge Project was a large-scale, temporary public art installation by artists Sarah Kavage and Nicole Kistler that was moored on Seattle's Duwamish River during April 2006. An industrial barge was filled with native plants, creating a temporary floating island full of ferns, shrubs and tree seedlings. At the end of the project, volunteers planted the plants from the Living Barge at Cesar Chavez Park in South Park. THANKS to everyone who helped make this project a success! 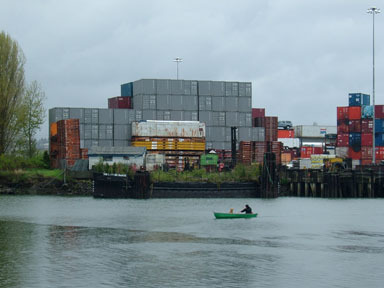 We wanted to use this project to create a lasting, positive dialogue about the history and future of the Duwamish and the neighbors and businesses that surround it, and raise citywide awareness. If you volunteered or participated in the events in April, help keep the Duwamish Cleanup a priority with the city and the EPA! Here's the latest on how you can help. Seattlest (here and here) called the Living Barge "the straight up coolest art installation of the spring..."
From Dan Bennett 's blog, some pictures of the Living Barge and the Duwamish on our opening day. Photographer Mark Sullo got some nice shots when we tugged the Barge upriver the day before the opening. For more pictures of the Barge and the events, see our photo page. To see the construction process, check out the construction journal. Michael and Barnacle check out the Living Barge on a rainy morning.